I actually made it a few weeks ago, but I never got around to telling you about it and at this point I’ve eaten it all, but now that the temperature has dropped below 80 in Seattle, it might be time to bake up a new batch. I think you’ll like it. I also think you’d like our house, which boasts an entirely barren upstairs floor but a downstairs that’s coming along just fine. I wish I could have you over for breakfast! We’d eat cornbread and honey and maybe some fruit salad, too. We could pick our own strawberries and mint from the backyard! We’d stoop low to pluck the small green leaves and the tiny, ruby things and we’d say hi to the spiders who keep watch over the garden. They still make me jump, but I’ve learned to appreciate those spiders. Kind of. Anyway, we’d eat our breakfast on the rickety wood bench under the lilac tree, and we’d pop some champagne because why not? and we’d probably talk about the Women’s World Cup and our upcoming trips (Paris and Spain for me – our honeymoon! – in just a few weeks — and you?) and how in the hell anyone keeps a potted orchid alive, and at what age, exactly, is a person considered too old to use a kiddie pool? Also, side note, where can one buy a kiddie pool? At any rate, I hope your summer is off to a warm and happy start! With cornbread? Cornbread is often considered the perfect accompaniment for hearty, cold-weather fare, but it does equally well at a summertime bbq, surrounded by fresh cole slaw and a plate of pulled pork. 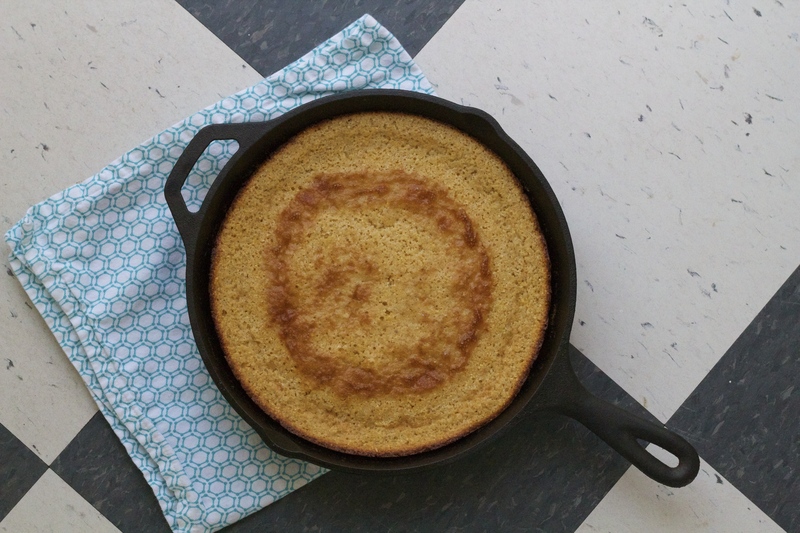 I know there’s a large contingency of southerners who balk at the idea of sugar in cornbread, but I like the faint sweetness and depth that a bit of maple syrup brings in this recipe. Also, don’t skimp on browning the butter – that step really makes this skillet sing. Preheat the oven to 325°F. On top of the stove, in an 11″ or 12″ ovenproof skillet (or, alternatively, in two 9″ ovenproof skillets) melt the butter over medium high heat. Cook the butter, swirling the pan(s) occasionally, until it starts to foam and crackle and, eventually, the milk solids turn a deep amber color. As soon as the butter has browned, pour it into a large bowl (but don’t wipe out the skillet(s)). Whisk the maple syrup, and then the buttermilk into the brown butter. Make sure the mixture is cool to the touch before whisking in the eggs, one at a time. Next, stir in the cornmeal, flour, baking powder, baking soda and salt, until a cohesive batter forms. 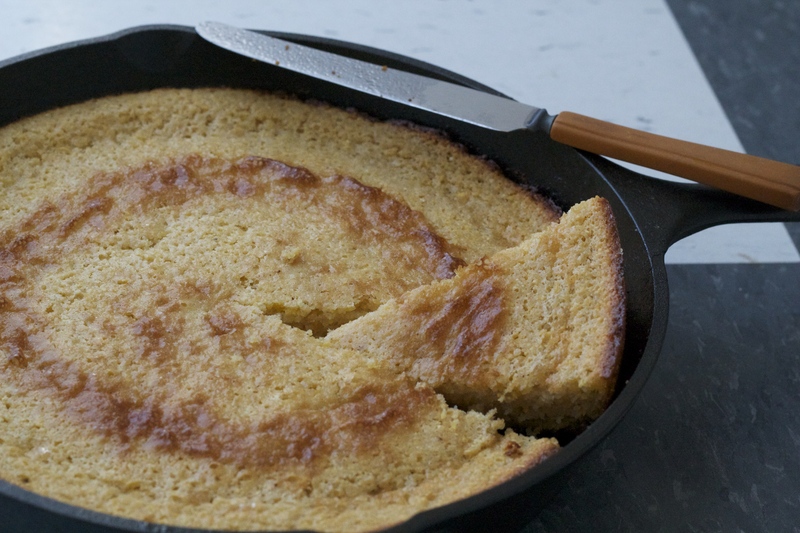 Pour the batter into the buttery skillet(s), and bake until the cornbread is deeply golden brown and a tester inserted into the center comes out clean, about 25-35 minutes. Enjoy the cornbread sliced in thick wedges, either warm from the oven or at room temperature. Wrapped tightly in plastic or foil, cornbread will keep for about a week (or longer) in the refrigerator — just warm it up in the oven or toaster before serving. Wow, this looks great, and I must say eating breakfast at your house doesn’t sound too bad! 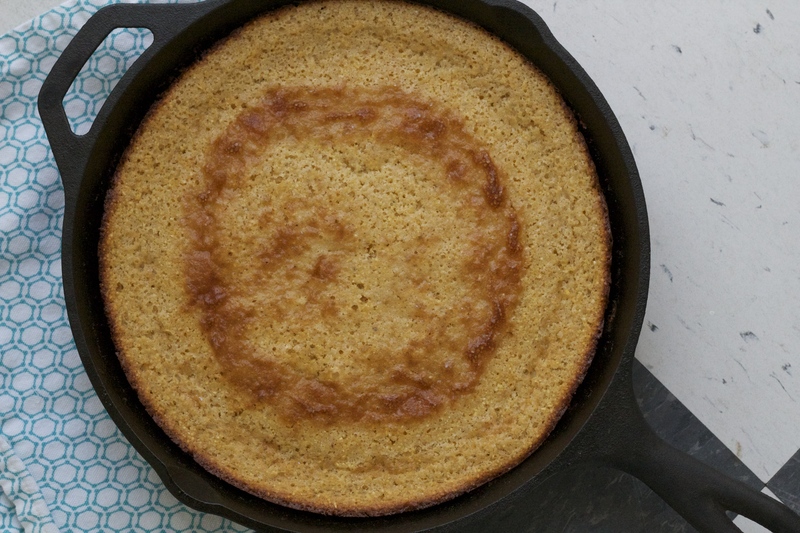 🙂 I love cornbread, and brown butter improves almost everything, so it looks like I have to give this recipe a try.